Abstract: Modern technologies have enabled approaches to estimate freshness of perishable products during production and distribution. Nevertheless, the loss of perishable goods is still high due to the perishing nature of products and handling inefficiencies. In this paper we focus on the scheduling of post-harvest handling of starch potatoes with real-time quality information. In particular we propose a scheduling method for starch potato post-harvest operation using a qualityaware modeling approach. 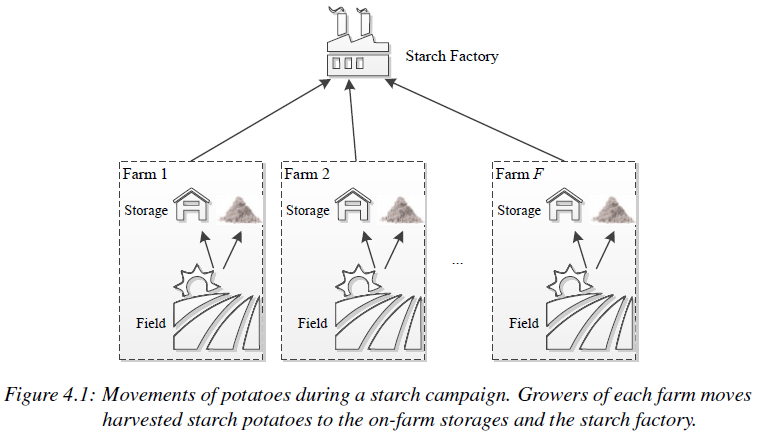 Considering the decreasing starch content in stored potatoes, the scheduling determines when and how many potatoes should be harvested, sent for starch production, or stored. With predicted quality information of potatoes, a centralized control architecture and a distributed control architecture are designed, with the aim of minimizing total starch loss. The concept of model predictive control is adopted to deal with environmental dynamics. Simulation experiments illustrate how the proposed approaches deal with disturbances, and that the total starch loss can be reduced when real-time quality information of potatoes is taken into account. Reference: X. Lin, R.R. Negenborn, G. Lodewijks. Predictive quality-aware control for scheduling of potato starch production. Computers and Electronics in Agriculture, vol. 150, pp. 266-278, July 2018.